There's no doubt now that Skype is coming to the Sony PlayStation Portable - Sony's own website, updated to preview next week's Consumer Electronics Show (CES) in Las Vegas, admits as much. "Call friends, talk trash to fellow gamers or catch up with acquaintances via Skype for PSP," the site says, letting the cat well and truly out of the bag. 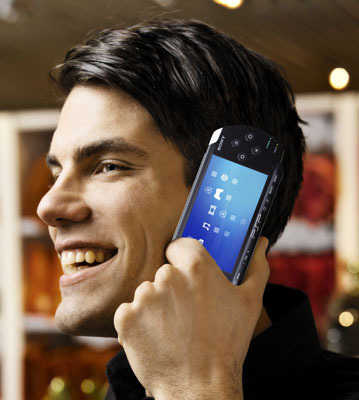 In May 2007, Sony Europe partnered with British Telecom (BT) to develop communications tools for the handheld. The result is Go!Messenger, a video chat and IM tool that's set to be made available to European PSP owners later this month. Go!Messenger will be delivered on a Memory Stick or by download rather than through a firmware update, Sony said last August, and it seems likely Skype will be provided the same way, potentially allowing users to choose which one they want. Sony Europe indicated Go!Messenger would only be pitched at Sony Computer Entertainment Europe's territories, but we hope Skype won't be restricted to US users. Both apps will undoubtedly be used to encourage PSP owners to buy microphone-equipped headsets and Sony's Go!Cam plug-on PSP webcam accessory.